A tramp has become the legal owner of a prime piece of land on Hampstead Heath in north London which he has lived on for more than 20 years. Harry Hallowes, 70, was handed the title deeds to the secluded woodland spot, thought to be worth £2m, after developers threatened to evict him. Mr Hallowes made a successful claim under what is called squatters' rights, a Land Registry spokeswoman said. He occupies a 12ft by 8ft shack which stands in a 90ft by 90ft garden. Mr Hallowes moved to England from County Sligo in Ireland at the age of 20 and ended up on the dole and soon started sleeping rough on Hampstead Heath. Property developers Dwyer international bought Athlone House nursing home and its grounds, in which the squat sits, in 2005. Previously Mr Hallowes had refused to claim the land as his own but his hand was forced when the developers moved to evict him. Solicitor Maurice Evans, acting on Mr Hallowes's behalf, made a claim for adverse possession and he was finally registered as the owner in September last year. A spokeswoman for Land Registry said Mr Hallowes had to prove he had been the sole occupier of the land for 12 years. Mr Evans said Mr Hallowes had no intention of selling the land and moving on. 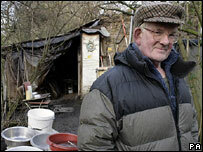 "All he ever wanted was to live on the plot of land that he had occupied for the last 12 years," Mr Evans said. The developers donated the plot of land to the Corporation of London, which owns Hampstead Heath, and it hopes to take ownership of Mr Hallowes's squat when he dies.